One of the coolest new products Hampton is premiering this show is the new Cut & Emboss Folders. Yes, you heard me correctly a folder that cuts and embosses at the same time! 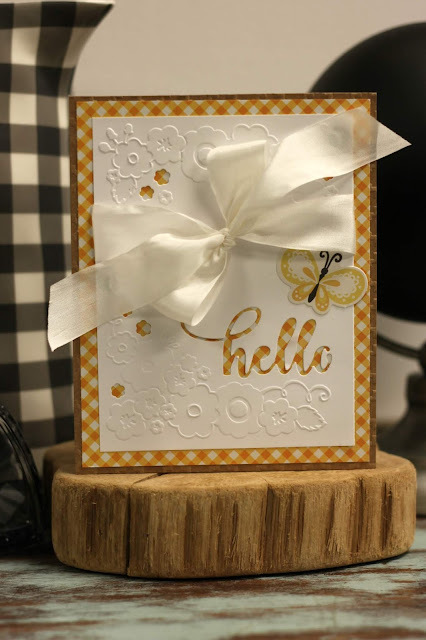 They are so much fun to work with, this card began with a white cardstock panel that was run through my Cuttlebug, Then the orange plaid was layered behind it. Then before attaching the panel tie on a white silk ribbon for the finishing touch. Such a pretty card is created in so little time!